Home > Mutual Funds - Alerts > as high as 32% of the mutual funds are WORTHLESS investments. ! as high as 32% of the mutual funds are WORTHLESS investments. ! As high as 32% of the mutual funds are WORTHLESS investments. That means over one out of every four mutual funds you put your money in is not able to beat the stock market, namely the BSE-200 index. That means over one out of every four mutual funds regularly give you returns even lower than the index as a whole. That means over one out of every four mutual funds are underpaying you for the risk that you are undertaking in the investment. In short, you may be losing money on your investment! 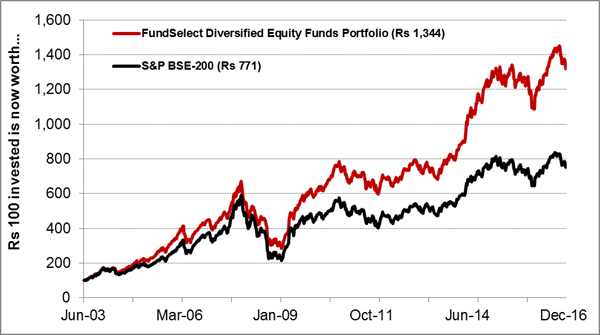 As studied by our team in June 2014, as much as 40 percent of the mutual funds outperform the market by a CAGR of meager 5%! When you count in the expense ratio of around 2%, you are left almost with nothing! In other words, almost one out of every two mutual funds is really going to disappoint you if you are looking for high returns. Is it really worth taking all that risk and paying hefty fees to the fund manager for what mostly turns out to be a very poor performance? So to sum it up, about 3 out of 4 mutual fund investments are NOT worth your money. All their expensive research...frequent trading costs...high fund management fees...everything almost amounts to zero. This gives the whole mutual fund industry a bad name and most of the average investors are led to believe that low-cost index funds might be a lot better for them.